Good mornin’ all! Hope you all are having a great Christmas and much needed extended weekend. Friends came over last night, Mama made a pot of mulled wine and I got hugged up with some Lagavulin 16. Man-Cub awoke to several hot wheels & Thomas mini’s this morning. Santa was good to us, and now we’re relaxing and enjoying the balmy 16 degree weather in Kansas City. We’re a week away from the showdown in Pasadena. I can’t wait. 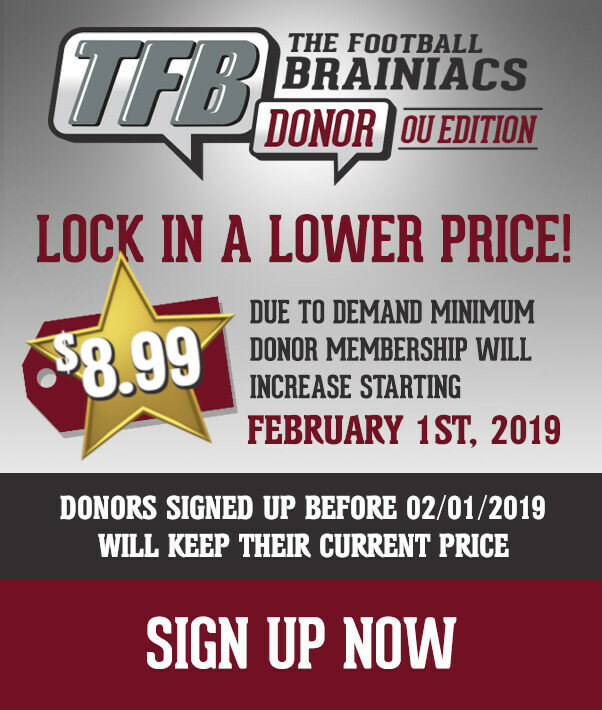 I just really want the Sooners to play a clean game with no giveaway mistakes. A muffed punt or fumble or blocked kick etc. Play clean in this one and we have a great chance to play for #8 two weeks from now. 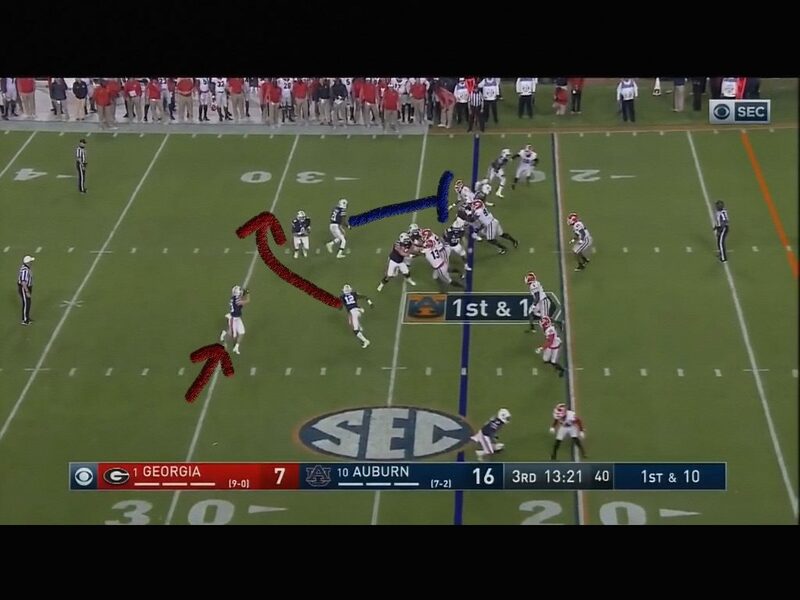 In the 1st matchup, Malzahn did a great job mixing up the play calls and using misdirection to nullify the Georgia speed. It’s a good fake screen to the bottom as the receiver cuts around on a reverse. 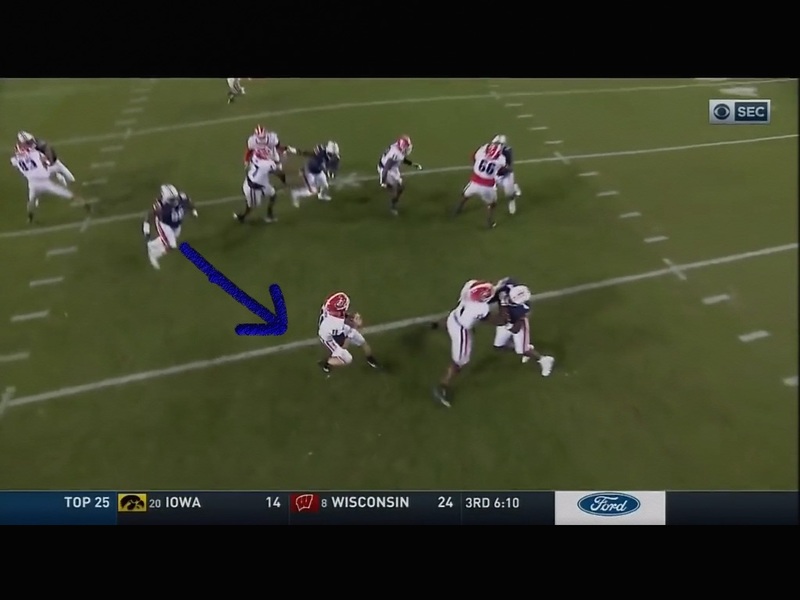 Kerryon Johnson is blocking the backside. Even if you don’t give it here on the reverse, it keeps the defense honest. As the receiver takes it around the corner, the Center does a great job “not chasing” the linebacker(blue arrow) outside. You’re taught in a sound run game, to keep working to the backside. 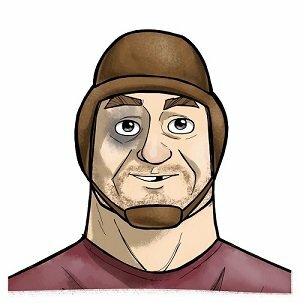 The thought is that as a lineman you’re not catching that blue arrow linebacker, so you yourself just create more traffic and give the ballcarrier less space to put a move on the blue arrow linebacker. Also, you have a more natural path to the backside player as shown below. 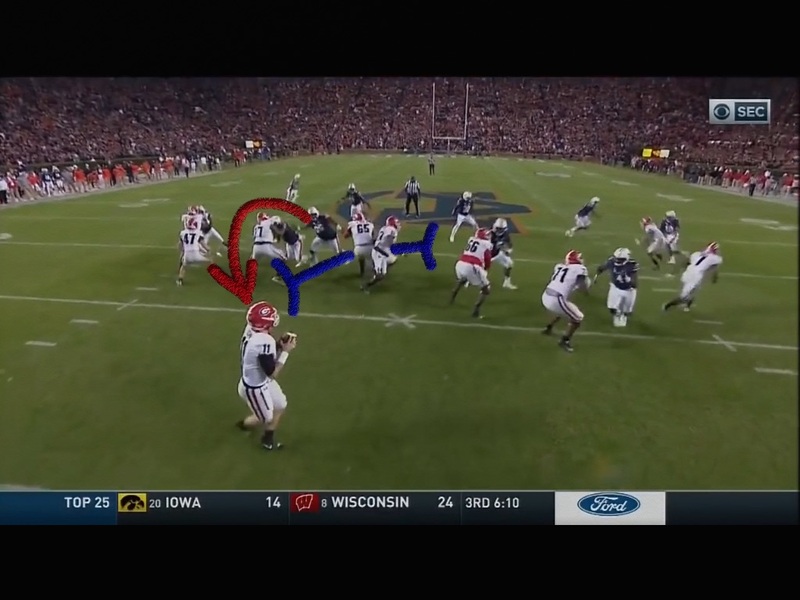 Also, if you chase that blue arrow linebacker it gives #3, Roquan Smith a free run at your ballcarrier. 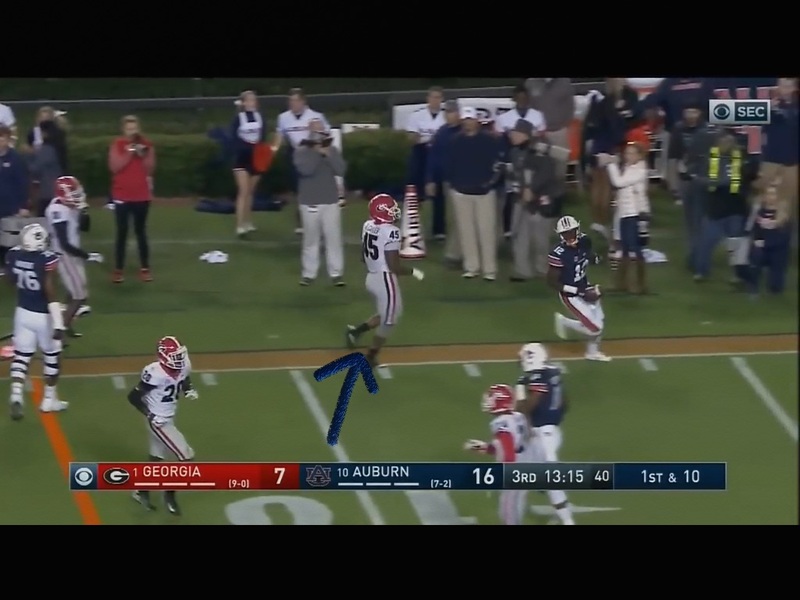 As your ballcarrier slows to juke the blue arrow linebacker, Roquan is most likely coming clean with an earhole shot on your runner. And you can see here, the receiver outran that blue arrow linebacker anyway. Also, because the center was fundamentally sound, the play gained a 1st down, and Roquan Smith is nowhere to be found close to the play. Moral of the story….Don’t chase linebackers! This is a lead option keep. Starting with the tackle, he has to do a better job coming straight off the ball. See how his shoulders are turned slightly? 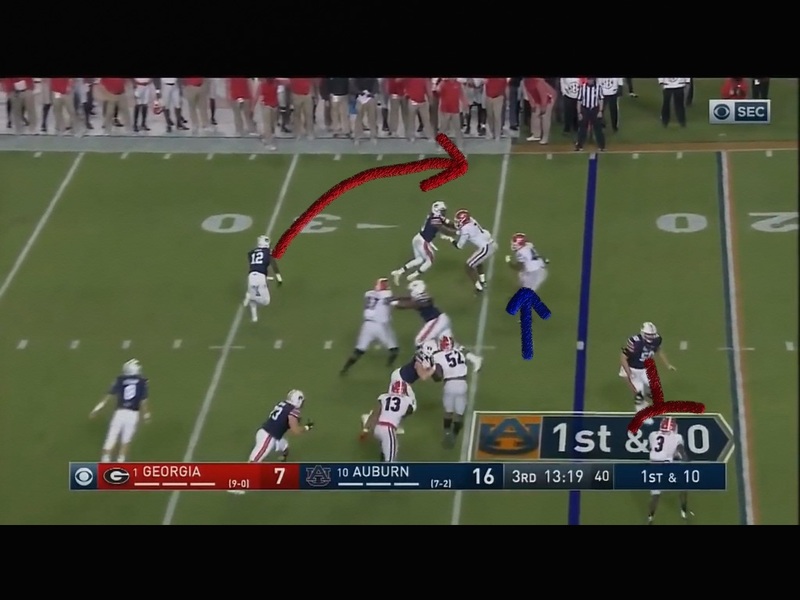 If he comes straighter off the ball he has a better angle and about a half a yard more outside leverage against #3 Roquan Smith. The red arrow defensive end would be forced to stay outside because you didn’t as a tackle let him crash down because you’re in the way. The fullback is pulling around to block #24, since your read player is the d end who you’re going to leave unblocked. 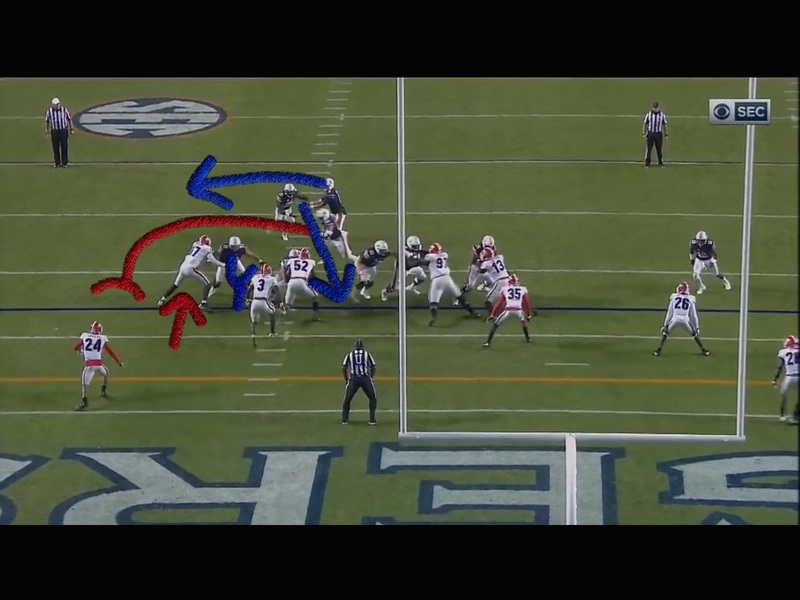 Kerryon Johnson is the give player going through the path along the inside blue arrow. So had the red arrow tackle stayed straighter off the ball, he probably gets a more clean block on the linebacker. A half a step is everything, but he still gets enough on the linebacker to keep him from making the play. 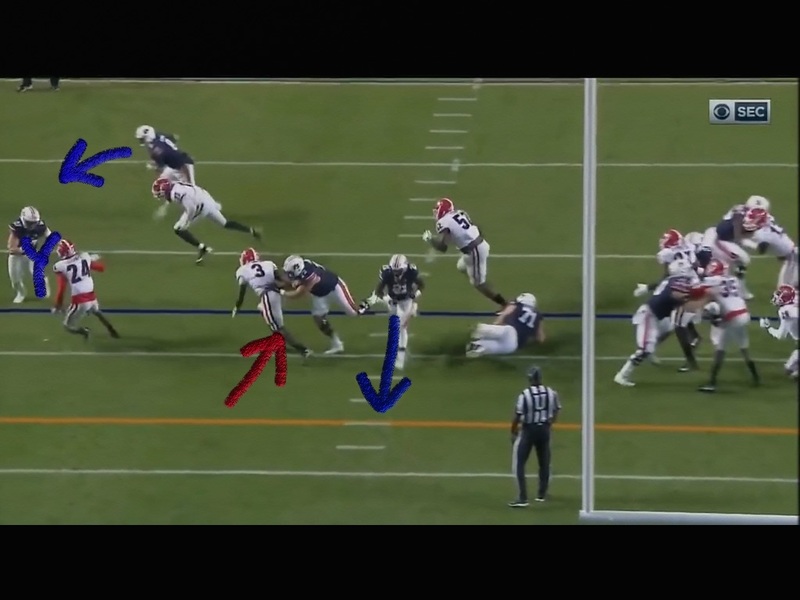 The read player is trying to come back outside, but Stidham has enough momentum to outrun him to the pylon. The fullback has a great angle to wall off #24 and spring his QB for the TD on the keeper. This is still a pretty good lookin’ play. The red arrow fullback has a great angle again walling off #24. The linebacker finally gets unblocked on the blue arrow and the tackle is powerless to watch because of how he stepped on the snap. Auburn scores anyway on a nice play. This is an unconventional twist. 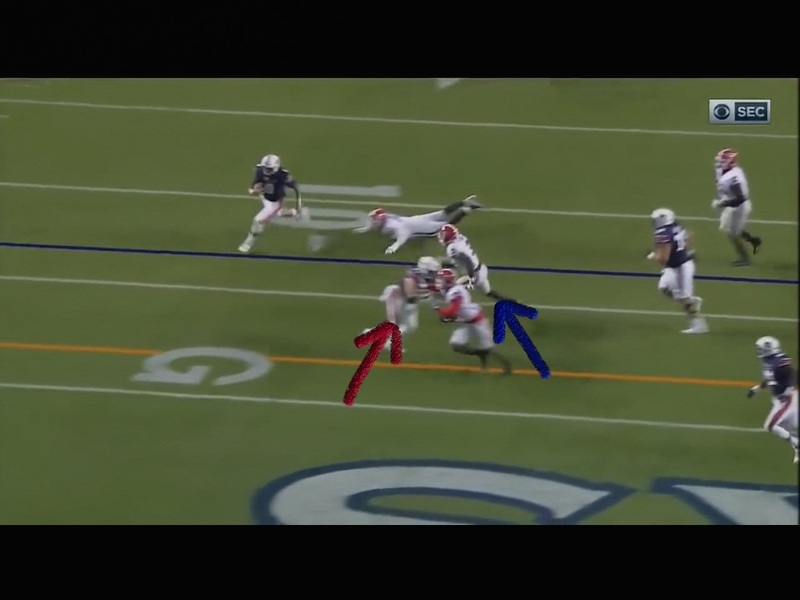 The red arrow DT is going to loop around the tackle. Normally on a twist, you’ll have the player who’s locked up with the tackle slant inside toward #65. Here though he goes out to the left tackle to prevent the tackle from passing him off to #65. As the guard, #65 sees this, he needs to peel back and meet the looper behind the tackle. Also, #47 has to feel this coming and help out. Neither happen though, and the big D-Tackle comes free on a 7 step drop. If the Sooners can get the Bulldogs to long yardage and then run twists, stunts and blitzes, they may create some negative plays for Georgia. Because even though Georgia showed they couldn’t protect 7 step drop plays consistently, they kept calling them. This was a way-lay of a hit that popped the ball out. 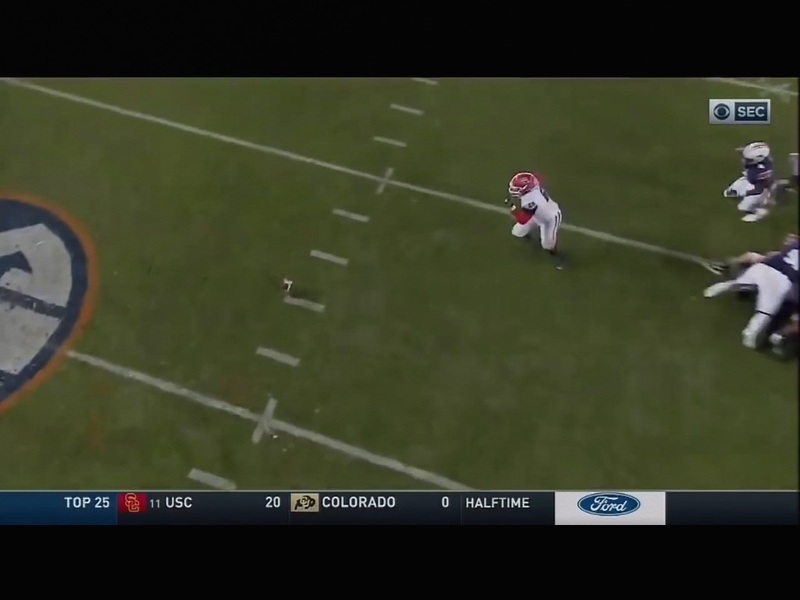 Georgia recovered it, but it was a big time negative play.